Rod Blagojevich never did anything wrong. So he told the state Senate on his political judgment day on Jan. 29, 2009, a day when he talked about being in a "lonely" place, about his daughters and about how the impeachable crimes confronting him were a big misunderstanding. It was the most sobering, desperate speech I ever heard as I sat in the Senate press box, perhaps 30 feet away from Blagojevich. No matter what he had said that day, minds already had been made up by his arrest and by four audio recordings of him hatching ways to make campaign cash off of his duties as governor. Covering him for six years, I learned that he was impetuous, short-tempered, stubborn and a camera hog. House Speaker Michael Madigan's spokesman, Steve Brown, questioned his mental fitness, calling him a "mad man," a "sociopath" and a "very disturbed" human being. Notwithstanding such questions, Blagojevich did have a poor grasp of detail, and I wasn't convinced he always told the truth. During a sit-down interview with me, Blagojevich stumbled when I asked why his first budget, passed roughly half a year earlier, hadn’t set aside enough education dollars to meet the minimum $4,810 per student spending requirement – the “foundation level” --established under state law. Blagojevich paused and didn’t have an answer, other than to ask awkwardly what the term meant. It was a key piece of the legislative vernacular when it came time to divvying up how much public money should go toward education. It was important. 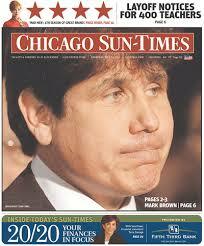 Covering Blagojevich was a golden era for statehouse journalism in Illinois. The ex-governor was full of surprises, like his late-December 2008 appointment of Roland Burris to the vacant Senate seat held by Barack Obama. Arrested weeks earlier by FBI agents, Blagojevich resisted calls for him to resign and to leave the appointment to his successor. My colleague, Chris Fusco, and I were the first to break the story of Burris' appointment by Blagojevich, narrowly beating the competition. I was also the first to pick up on and publicize a seemingly minor contradiction between Burris' testimony and an affidavit that he tendered to the House impeachment panel before he was scheduled to testify. Burris stated in that document that he had spoken to no one in Blagojevich's inner circle before the appointment. During a hearing a few days later, Burris acknowledged having spoken to one person within Blagojevich's camp. To this point, Burris neglected to mention he had been solicited for campaign contributions. Over time, Natasha Korecki and I paired up on an award-winning series of investigative pieces that showed Burris, in fact, was asked to make campaign contributions by Blagojevich's brother prior to the appointment. Korecki and I outlined how Burris changed his story multiple times, seemingly the result of being interviewed secretly by federal agents and told about government recordings. A U.S. Senate ethics investigation ensued. "Thank God for the Chicago Sun-Times 'cause we never would have known about this information," then-House Minority Leader Tom Cross told his colleagues on the House floor as he expressed frustration surrounding the Burris appointment and what he regarded as Democratic attempts to protect Burris from GOP questioning about his appointment. 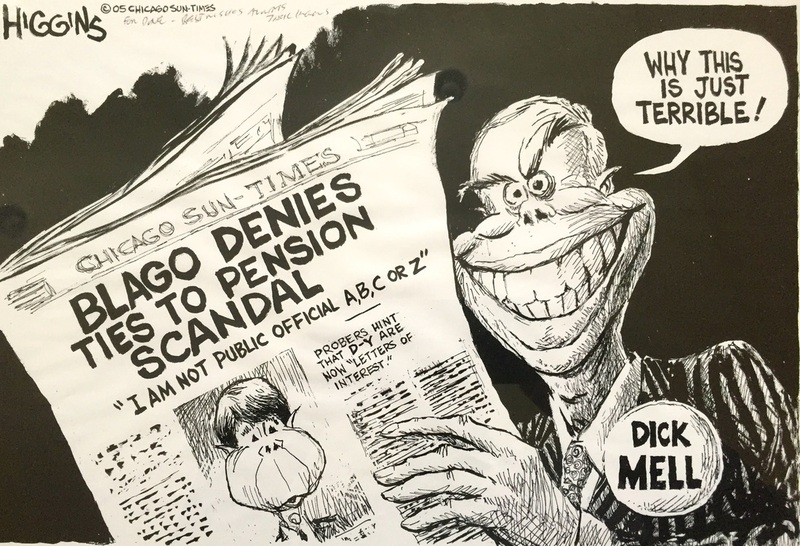 "It was destined to a back room; it was destined to a file cabinet; it was destined to somebody's file, never to be seen in public if not for the Chicago Sun-Times," Cross said. That work represented a high point in my journalism career -- as did a chance encounter with Blagojevich on the day he was driven from office in January 2009. For 47 minutes, I watched and listened to his speech from the GOP side of the Senate press box as he pleaded with state senators not to convict him on articles of impeachment and oust him from office. My son, Matt, had skipped a day of high school to watch the historic day’s events and was in the Senate galleries. When the speech ended, I snapped a cell-phone picture of Blagojevich leaving the Senate floor then set out to figure out which Capitol exit the defrocked leader would use to leave the building. Reporters from across the county fanned out and seemingly had every exterior doorway covered. There is a reason new journalists are coached to make friends with the janitors, security guards and secretaries in buildings they cover. They see and hear a lot. And so it was that day. I turned to a security guard whom I’d befriended and asked where Blagojevich would be coming out. Stationed at the Capitol’s north entrance, the guard pointed across the street to a state building that was connected to the statehouse by a little-used steam tunnel. “Over there, but don’t say how you found out,” my friend, the guard, gestured. Out the door I went and within moments, it was clear the guard was right. An idling black sports utility vehicle manned by members of the governor’s security detail awaited behind the Secretary of State office that houses its index division across from the Capitol. There was about a two-second walk from the building's rear doorway to the SUV. There was time for one question. When Blagojevich emerged, I asked him whether he felt obliged to tell Illinoisans he was sorry for the embarrassment he’d put them through. 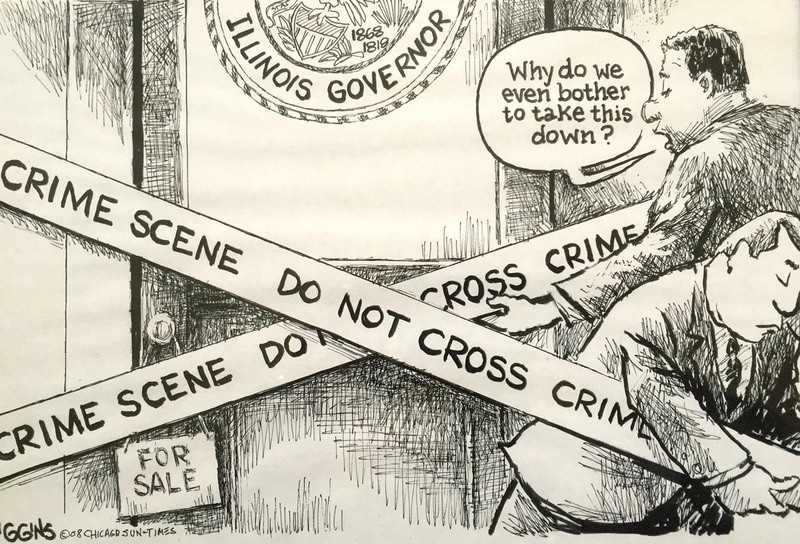 The phrase was blown up in 72-point type on the next day’s front page of the Sun-Times and summed up everything that was wrong with the way Blagojevich chose to govern Illinois during his six years in office. In this Getty Images pic, Blagojevich names Roland Burris to Illinois' empty U.S. Senate seat. And the Associated Press shot above shows Blagojevich, with wife Patti, addressing the media at the Dirksen Federal Building. "Thank goodness one of the things we can't seem to influence in this state is the impact of a free press. Would any of this have come to light had it not been for a reporter of the Chicago Sun-Times who called this into play. " --Former Rep. Bill Black, talking Feb. 18, 2009, on the House floor about Roland Burris' contradictions and what he saw as Democratic efforts to protect him. 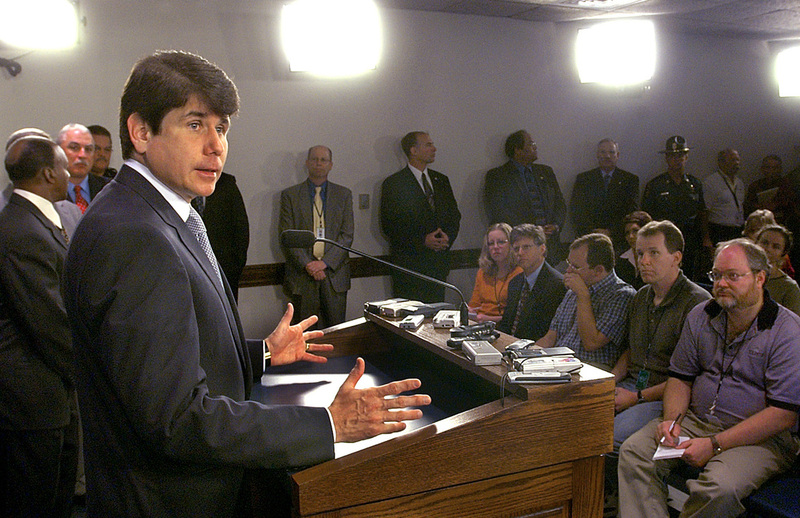 In this AP shot, Blagojevich addresses the statehouse press corps on the day a Capitol security guard was shot to death. 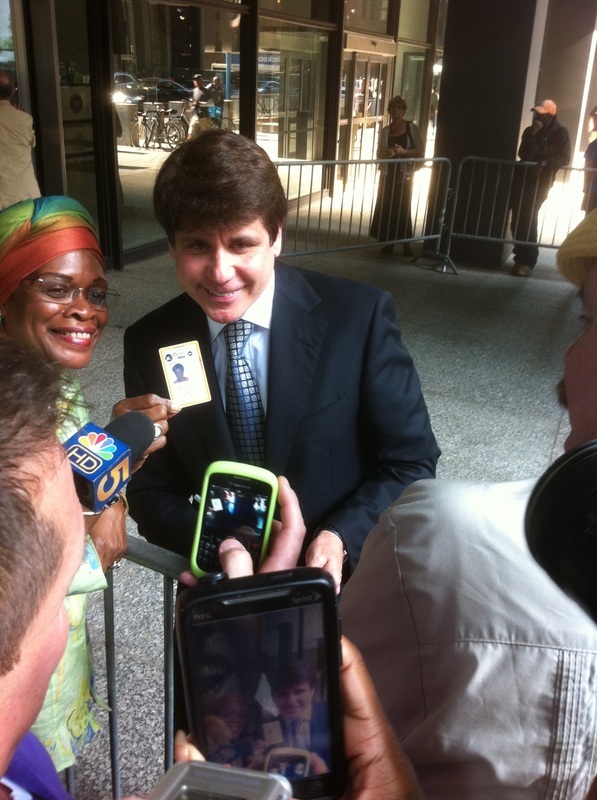 Blagojevich hams it up for cameras as he enters the federal courthouse. 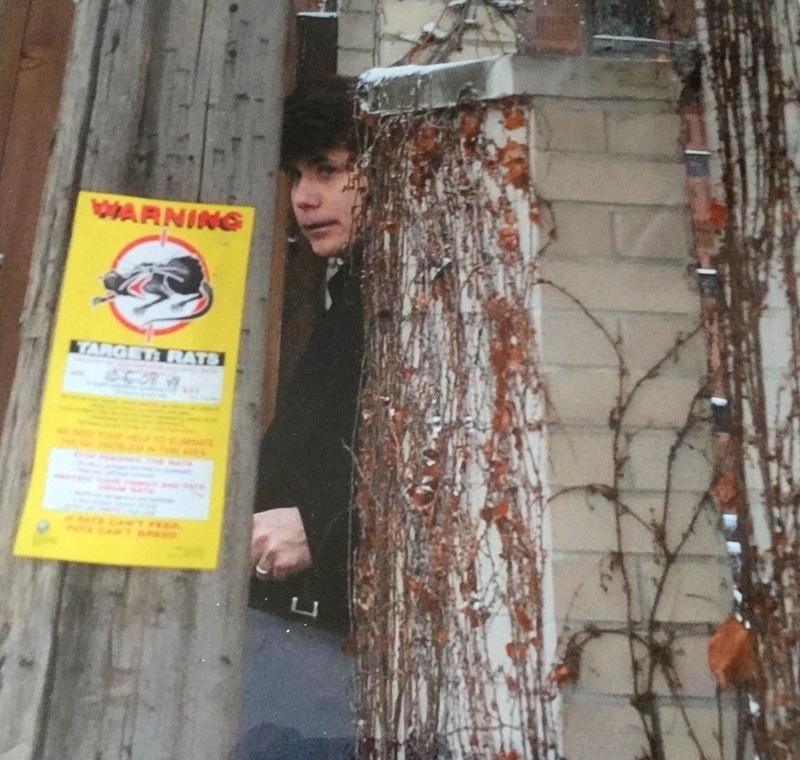 Pulitzer Prize-winning photographer John White captured Blagojevich's arrest perfectly, pairing the former governor with the rat warning on a utility pole. White gave me an autographed copy of this remarkable picture. 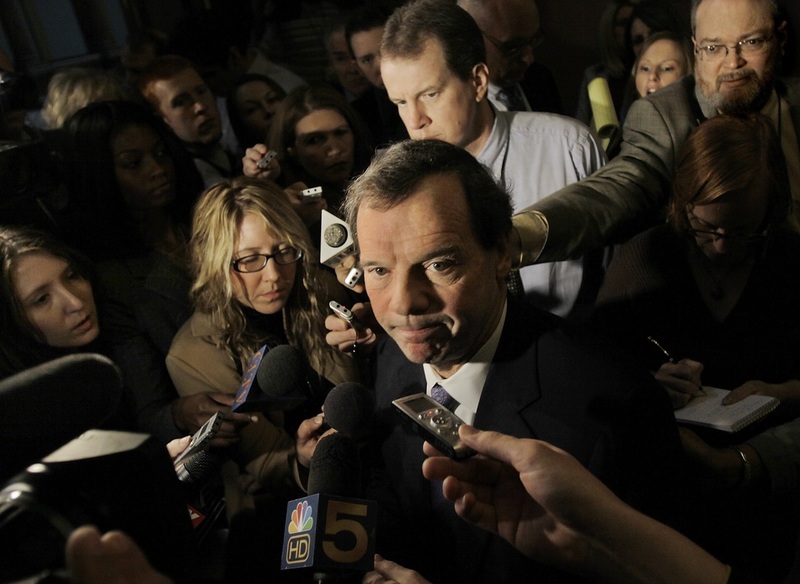 In a Seth Perlman shot, Senate President John Cullerton lays out the steps the state Senate intends to take to drive Blagojevich from office. Before Blagojevich's legal troubles exploded, he and House Speaker Michael Madigan share an awkward embrace at the Illinois delegation breakfast at the 2008 Democratic National Convention in Denver. The "hug" between the two mortal enemies, prodded by imprisoned ex-U.S. Rep. Jesse Jackson Jr., was captured by photographer Lee Milner. Using my cell phone camera, I took this picture of Blagojevich as he strode past the Senate press box and off the chamber floor, shortly before the historic 59-0 vote to oust him from office in January 2009.